Simplicity Consulting offers affordable monthly pricing and can help you choose the plan that is best for you. Don't see a plan below that fits your budget? Give us a call or email us for a custom quote. *Bill.com processing fees not include in monthly pricing and will be billed separately. Please see Bill.com for further information. 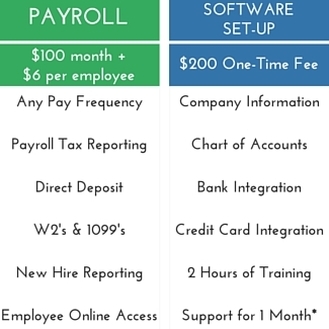 Simplicity Consulting offers payroll as an additional service to the above monthly packages. We also offer one-time software selection/set-up/training if you feel you can run things on your own.